Saban and Belichick are both Bon Jovi fan boys. They used to go to shows together. That's gotta be the weirdest fact I've read. I can't imagine those two grumpy old bastards rocking out. 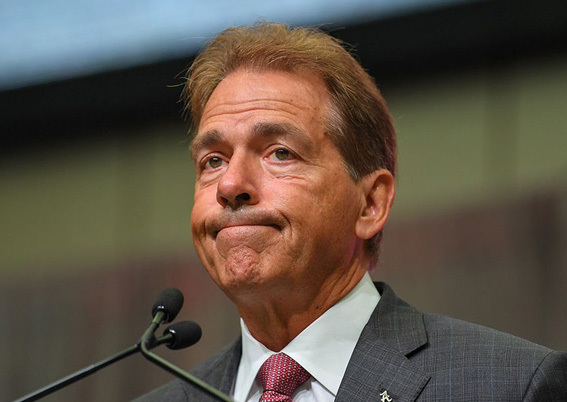 ..."10 Things You Might Not Know About Nick Saban"? Interestingly, "Sweet Home Alabama" makes Nick Saban puke. A paradox indeed. I saw the title of the thread and thought one of us just had our identities compromised. Now I see it's some sort of public figure. I'm sure he's a swell person and likes small animals, but I'll never know. He gives off a Huey Lewis vibe. That makes me doubt him. Nothing like celebrating a football win like playing a murky, evil, downright sleazy song like GS.....perhaps he will have Midnight Rambler played at his daughters' wedding!?? i read on the interweb that he’s an iorr lurker. I was thinking the same thing, but Saban is a joyless, angry curmudgeon. It fits.